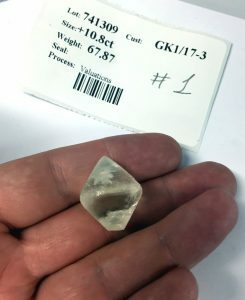 TORONTO – Mountain Province Diamonds has reached an agreement with Dominion Diamond Mines which certifies Mountain Province polished stones under the CanadaMark trademark. Joining the program assures customers of the supply chain integrity of Canadian diamonds from mine to retail. The CanadaMark program is an initiative of Dominion. Diamonds so certified are natural and untreated. They have been mined in Canada under rules that protect the natural environment and northern peoples. CanadaMark certified diamonds are tracked through independent, audited processes from mine of origin to polished stone, and polished to meet specific quality standards. The CanadaMark program has a website at www.CanadaMark.com.